Despite the negativity concerning fellow Big Bang member Daesung after being involved in a car accident, Seungri has enlightened their fans after his recent me2day update. On a recent update, Seungri was quoted saying, “I want us to be five members ^^ Forever.” The update also contained a photo of Big Bang, complete as five members. Fans who have seen the update were touched by Seungri’s indirect message to Daesung, after all the press coverage. Recently, Daesung along with YG Entertainment, have finally reached a settlement with the victim’s family and is likely to be summoned again for another round of investigation. Meanwhile, Seungri will join the rest of YG Entertainment as they fly to Japan with 2NE1 for a special event. Details of their new announcement will be confirmed live via UStream tomorrow. What are your thoughts on Seungri’s me2day update? Big Bang and IU were the most pirated singers of April 2011, according to a report released by the Korean Copyright Commission. There were 4321 total known cases of piracy of Big Bang’s music, and 3874 cases of IU’s. SG Wannabe came in third with 3366 cases, CN Blue had 2313, and 4minute had 1502. The most pirated song was IU’s “Good Day”, with 848 cases. Next came Mighty Mouth’s “Tok Tok” (789 cases) and Big Bang’s “Tonight” (779 cases). Big Bang just wrapped up a tour in Japan, and IU is currently appearing on variety shows such as “Kim Yuna’s Kiss and Cry”. In the past, IU’s fans have come together to combat piracy, which is credited for the steady decline in overall sales of music in Korea. With Big Bang’s Japanese promotions set to begin in early May, many fans have expressed their concerns over the group’s safety in Japan because major aftershocks have been disrupting all over the country lately. However, much to their relief, YG Entertainment has confirmed local media today that Big Bang’s Japanese promotions will be shortened to two weeks, as opposed to the original two month plan, and the Tokyo and Yokohama concerts will be postponed indefinitely. “All Big Bang members really want to do the concerts in Japan as originally planned to show their support and love for everyone hurt by the recent disaster. But there still are major aftershocks happening in Japan, and many fans from other countries have voiced their concerns over Big Bang’s security. We thought it was a major concern too so we decided to postpone the Tokyo and Yokohama concerts, which haven’t sold any tickets yet,” an official from YGE told Star News Money Today. However, the concerts in Osaka, Chiba, and Nagoya will be held as planned since all tickets have been sold out already and the members have visited the concert halls in each city twice to check out the security there, according to the official. This means Big Bang will hold a total of eight concerts over two weeks in Japan: Osaka from May 10th to 11th, Chiba from May 13th to 15th, and Nagoya from the 17th to 19th. Big Bang released their special edition album on Apr. 8th and will promote the album until May 1st in Korea. Their second full Japanese album will be released on May 11th. Fans can start saving up for the most anticipated K-pop concert of the year! We’re betting that memories from last year’s Korean Pop Night Concert 2010 are still deeply etched in the minds of everyone who turned up. All 8,000 of you! Whoever could forget the highly-energetic performances by Big Bang, Girls’ Generation, SHINee, FT Island, Infinite, ZE:A and The Boss? Last year, xinmsn was the official online media of the Korean Pop Night Concert 2010. And K-Pop lovers, you’re in for a treat again this year. Watch out for Korean Music Wave 2011, once again helmed by Proof Label. The one-night only event will be held on July 15, at the Singapore Indoor Stadium. A total of seven bands are slated to perform, with Big Bang returning this year! Comprising of leader GD, T.O.P, Taeyang, Daesung and Seungri, Big Bang recently returned to the music scene with their fourth mini album Tonight, after a hiatus of two years and three months. 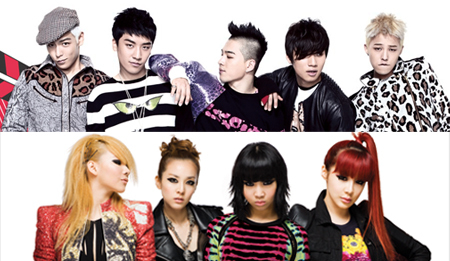 This time, Big Bang will be bringing along their juniors 2NE1, who first appeared in Lollipop, a commercial campaign. These two groups will also be headlining the concert. Made up of leader CL, Sandara Park, Park Bom and Minzy, 2NE1 made its debut in May 2009 with the single Fire and have released one extended play (EP), 2NE1 and one full-length studio album, To Anyone. Proof Label will be revealing the five other bands and ticketing information shortly. Tickets will be sold through SISTIC. xinmsn is proud to be the official online media of the Korean Music Wave 2011. Stay tuned to xinmsn and join our Facebook page and Twitter for the latest updates on Korean Music Wave 2011! YG Entertainment and Big Bang released their second teaser for the 0.5th mini-album, and first teaser for the song “Love Song.” It seems that they will be revealing small snippets of the song sung by each of the members of Big Bang. The first teaser for “Love Song” features Big Bang’s T.O.P. Big Bang will be going for a more “bare face” concept for this round of promotions, and fans will experience a more “relaxed” Big Bang. Big Bang’s 4.5 Special Edition album is set to be released on April 8th. Have you pre-ordered your copy of the album yet? We previously reported on the track list for Big Bang’s 4.5 album, and now YGE Shop has the album up for pre-order, with some new details. Though the album price of 17,000 won ($15.44 USD) and a pre-order date ending on April 7th are new info, the biggest revelation is the album cover. The new cover contrasts with the teaser cover, which was starkly put on a white background, and the mini-album cover, which was white-on-black. This new album cover features a neon green skull outline. If you look closely, you can tell that the skull’s teeth form the keys of the piano. The album will contain 10 songs, a Big Bang poster, YG Family Card, and a 100+ page photobook. The album can be pre-ordered at YGE Shop. The boys of Big Bang have made the recent release of their mini-album “Tonight” only a teaser of what’s to come from them in 2011. YG recently announced that the quintet is preparing for another album release this year as well. To the delight of VIPs, Big Bang plans to record a new album as well as work with big name international producers to produce an even more exciting album. The boys are expected to begin recording their new album once they wrap their current Korean promotions and their Japan tour. The YG representative further added that they are in talks with ten producers from the United States and Europe. Once the album’s producer has been confirmed, he or she is expected to collaborate with Big Bang’s own producer: G-Dragon. Are you looking forward to even more material from Big Bang this year? Earlier this week, Big Bang made a comeback on M! Countdown with “Cafe” and “Tonight.” In addition, last night they also performed “Tonight” for their comeback stage on KBS Music Bank. Big Bang grabbed their second M! Countdown Award and their second K-Chart since their comeback. Will they grab their third award at Inkigayo tomorrow night? What’s your favorite part of their “Tonight” performance? Not only has Big Bang had an explosive music show comeback, they’ve also been setting YouTube ablaze, as well. Since releasing the music video for their single “Tonight”, the 5-member group has racked up over 2 million views for that video alone in just over a week. The video not only ranked highly in Japan and Korea in terms of views (2nd), but also made it into the top 10 in countries such as Australia, New Zealand, and even France. In addition, the band’s official channel, BIGBANG, boasts over 6 million views itself. Such records disprove the statement made by Japanese journalist Taro Kimura, which claimed that South Korea was attempting to increase views for K-pop videos by themselves, when it is clear that the views are international. What do you think of the statement? Do you think K-pop’s views are more international than Korea-based? Be stalker and get news…..